Like many budding internet-types looking to monetize from content, I have a Google Adsense account; the adverts for which can be seen on this very page. I am a fairly typical user who exists in the mid-range of popularity where I break the minimum payment threshold every month, but I’m not a mega-bucks earner who lives off it. I have noticed however that Google’s earnings revisions have been getting very harsh in recent months. 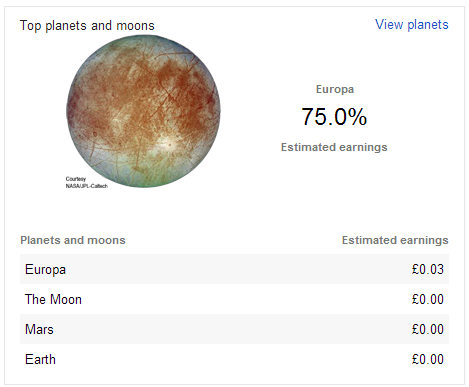 Fairly significant sums of money are being knocked off my earnings total when Google does its final revenue ‘checking’ about a week after the end of the month. In May 2011 Google apparently changed the way it calculates and adjusts for invalid clicks such that if you were seeing a discrepancy in the way earnings were calculated, you were assured it was just because of the delay between the initial clicks and the method used to calculate invalid ones. Ultimately you were being told you hadn’t ‘lost’ money, it was actually money you’d never earned to start with. More recently Adsense has been making adjustments much faster – in real time. I often notice that my account will say I’ve earned, say, £3 so far on a certain day, but when I check back later it’s gone down to £2. Some adjustment is being made constantly, and yet my final earnings still get revised at the end of the month on top of this real-time mechanism. * Google had a payment error in September 2011 for many users, resulting in their payment being deferred to October. The figure for October is the August/September earnings combined. In the last few months there has been very evident spike in the size of the earnings revisions being made. My usage of adverts is strictly legitimate, so I’m at a loss to explain how Google are deciding why so many more clicks are invalid. The major problem with Adsense is its lack of accountability and reporting on this issue. You’ve given a revised figure, but absolutely no indication how it was calculated. There is no breakdown of total clicks against valid and invalid clicks, or the methodology used to determine invalidity. Google is the least accessible vendor for advert publishers, because there is no direct support line, email address, or contact form. All online enquiries are very tightly funneled against an FAQ of common problems, and give you no opportunity to raise a free-text question. In other words, there is no appeals process against revised earnings. It’s calculated without explanation, and applied with no way to complain. Google long ago abandoned all references to ‘Don’t be evil’, and while this isn’t evil necessarily, it’s certainly unhelpful, confusing, and limited, but more worryingly, deliberately so. Much will already have been said about the excellent little Les Paul Google Guitar on the Google homepage logo today, but what you might enjoy are a few simple guitar tabs.